The perfect combination of black tea, honey, spices, vanilla, and cane sugar come together in this Oregon Chai slightly sweet chai concentrate! Serve it over ice to make a silky smooth summer refreshment, or prepare it hot to keep your guests warm on a brisk day. Since it has an extra hint of sweetness, this mix makes a great base for a number of dessert drinks and even baked goods! 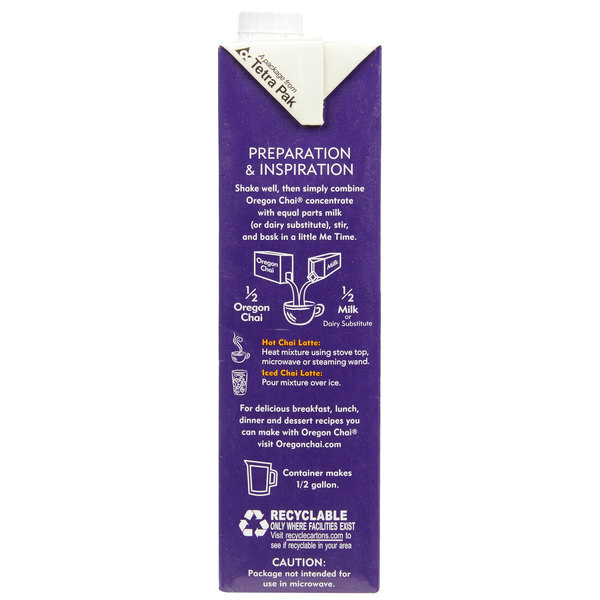 Thanks to Oregon Chai's HeliCap screw top opening, you'll be able to reseal the product to keep it fresh. As an added benefit, the hassle-free circular opening facilitates a smooth flow of product so you can easily mix up chai lattes. Though creating a chai latte from scratch takes time, this convenient 32 oz. 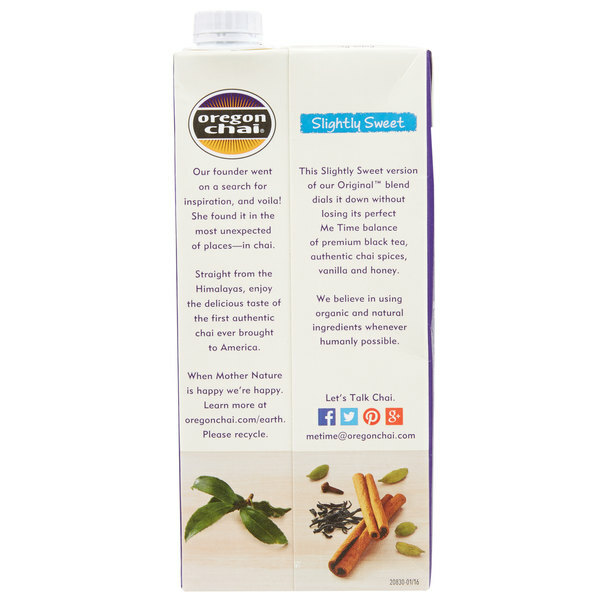 carton of slightly sweet chai latte concentrate can create the perfect warm and inviting spiced drink in an instant. Just mix equal parts concentrate with your own milk or preferred dairy substitute, heat it up, or pour it over ice. That's it! Using all-natural ingredients and stress-free measuring, you can easily add profitable, chai-flavored drinks to your menu. After tasting a mysterious, creamy Himalayan drink that was both spicy and sweet, Oregon Chai's founder went to work perfecting her own authentic chai recipe. 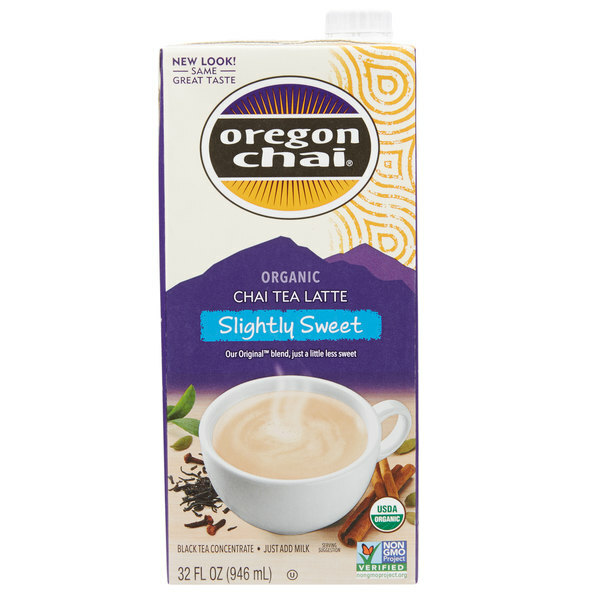 Now, Oregon Chai is the number one selling chai brand, and offers this all-natural chai in a convenient slightly sweet concentrate! The warm blend of exotic spices in a chai tea latte not only promises tranquility and good karma, but it also makes a perfect addition to your cafe or coffee shop. 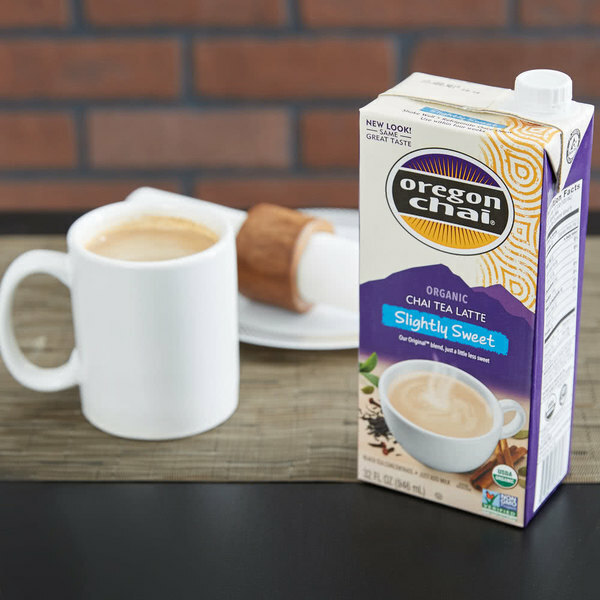 Combine Oregon Chai® with equal parts milk or dairy substitute, stir, and serve. Though combining equal amounts of Oregon Chai and milk (or any dairy substitute) is recommended, the concentration can be adjusted to create a custom taste. The Oregon Chai Slightly Sweet concentrate tastes amazing! We always have tea here at Rebel Raw, so its nice to have a latte concentrate when you want something quick and easy. This is not overly sweet like the name states, and the chai flavor is excellent. I definitely recommend this product! A lot of the powders, mixes and concentrates can be on the sweeter side so it's nice to have a less sweet option. Taste just as good as the original! This tea concentrate is amazing! I like to mix it with almond milk and whey protein every morning, and it keeps me running throughout the morning! The Oregon Chai Slightly Sweet Chai Concentrate tastes great and has a nice aroma. My customers love it. I would recommend this for any coffee shop. Oregan Chai's slightly sweet concentrate is so good! It's a great quality product and is easy to make: just add milk! The level of sweetness is perfect. This is the best one of the flavors I have tried so far. The sweetness is just right. Overall is a decent chai, but for pre-made chai it's not bad. This is an excellent choice for a less sweet chai concentrate. I like to use it for chocolate chai drinks and any other time I want to add a flavouring syrup to my chai. This chai has a lot less of a spicy quality than other brands.